Prime Minister Narendra Modi, addressing the country tonight, announced that Rs. 500 and Rs. 1000 notes will not be used from midnight onwards. The Rs. 500 and Rs. 1000 notes must be deposited at post offices and banks by the end of December, the PM said, adding the move was essential to fight "the disease of black money." In his televised address to the nation, Modi said people holding notes of Rs 500 and Rs 1000 can deposit the same in their bank and post office accounts from November 10 till December 30. 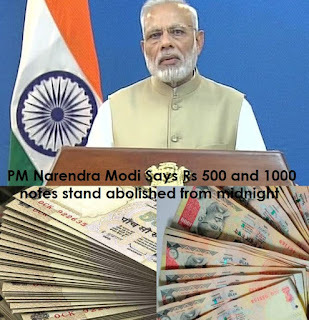 Modi said the notes of Rs 500 and Rs 1000 “will not be legal tender from midnight tonight” and these will be “just worthless piece of paper.” However, he said that all notes in lower denomination of Rs 100, Rs 50, Rs 20, Rs 10, Rs 5, Rs 2 and Re 1 and all coins will continue to be valid. He also announced that new notes of Rs 2000 and Rs 500 will be introduced. ATM withdrawals will be restricted to Rs 2000 per day and withdrawals from bank accounts will be limited to Rs 10,000 a day and Rs 20,000 a week. Banks will remain closed tomorrow and ATMs will also not function tomorrow and day after, Modi said. He expressed confidence that the staff of banks and post offices will rise to the occasion to introduce the new order within the available time. He also expressed confidence that political parties, workers, social organisations and the media will go further than the government in making it a success. Besides depositing money in bank accounts, the Rs 500 and Rs 1000 notes can also be exchanged with lower denomination currency notes at designated banks and post offices on production of valid government identity cards like PAN, Aadhaar and Election Card from November 10 to November 24 with a daily limit of Rs 4000. Those unable to deposit Rs 1000 and Rs 500 notes till December 30 this year can do so in designated RBI offices till March 31 next year after filling a declaration form along with proof and reasons, the Prime Minister said.